Europe is home to the most data centers in the world, making up almost half of the entire market—and there’s good reason. The EU is the perfect hotspot for connectivity, enjoys prime customer service and there’s plenty of commercial space to dedicate to secure data centers. Plus, the superior architecture and design available throughout Europe has led to world class data centers which are used as models around the world. Your dedicated server deserves to be in a data center that’s managed by experts. Particularly for European-based businesses, it just makes sense to choose a dedicated server in Europe. At SIMPLEXHOST, dedicated server setup time is fast and easy. Your server may be up and running in just 24 hours, or it might take up to 72 to ensure fraud protection. Every order is looked at closely to guarantee that it’s installed correctly and safely. Getting your technology kick-started right the first time around is paramount. There’s no corner cutting here, which is a good thing considering many dedicated servers are serious investments. The vast majority of businesses don’t “need” a dedicated server, but all would opt for enterprise-grade hardware if the budget allowed. Enterprises, major corporations and other big businesses require dedicated servers for optimal security and performance. SIMPLEXHOST specializes in serving enterprises, which is why all hardware technology used is the latest version and all managers, as well as technicians, are well trained and experienced. As an enterprise and leader in your industry, you know only the best will do. That’s what SIMPLEXHOST delivers. Get 1 Gbps connection featuring Cisco Systems throughout every single network layer. Even better, the network is completely redundant from top to bottom. 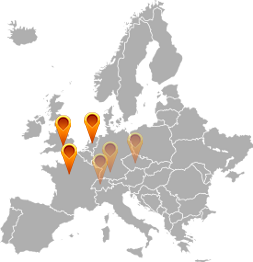 With four locations in Europe to choose from, you’re sure to find a dedicated server team via SIMPLEXHOST that’s local to you, culturally sensitive and literally speaks your language. We just deliver what you need. There are many types of web hosting. Some are free, but perhaps you want a cloud virtual private server just for you. Understanding the best type of hosting for your needs, preferences and budget is critical. SIMPLEXHOST helps direct you to the best plan of action (POA) for you. Few people need a dedicated server, but it’s a necessity for enterprises and major corporations. Connect with SIMPLEXHOST, and together we’ll go over each option’s pros, cons and price points. There are also various web hosting sizes (or accounts) which dictate just how big your application can be. Within this realm, there are many nuances. Do you have a small, personal blog or are you a mega e-tailer ready to take on the likes of Amazon? Depending on your size, growth and goals, different sized web hosts must be considered. Copyright © 2019, SIMPLEXHOST LLC.. All rights reserved.